It seems like just yesterday we were standing outside brushing the snow off of our cars. And even if that actually was just yesterday due to this crazy spring weather all across the country, there’s no better time than now to start planning your summer family vacation. Planning your vacation and booking right now can help ensure that you will find the perfect place to stay and won’t have to compete with other travelers. If you have no idea where you want to take your family this summer, here are some suggestions. If you have a family who loves to have fun, play games, and sit on a beach, Ocean City, Maryland may be the place for you. The city is full of delicious food, fun activities such as mini golf, and a place to get your camera on. One major suggestion for visiting Ocean City is that you plan early and book your accommodations as soon as you possibly can. The vacationers tend to stop through between the months of June and August, which is prime vacation time for families. Interested in taking your family to see one of the coolest Wonders of the World? Then head to Niagara Falls, either in New York or in Canada. The New York side of Niagara Falls is full of tourist attractions and some delicious restaurants, but it’s also home to a major casino which is a hit for many adults. The Canada side is also pretty touristy, but it has the best views of the falls and even a Ferris wheel. Want to do something that isn’t surrounded by beaches? New York City is the place for you. You and your family can enjoy a stroll through Central or Bryant Park, Time Square, and enjoy some pretty amazing shopping. There is food for any taste bud, so you don’t have to worry about your children arguing over where you’re going to eat. It is a huge tourist trap, especially in the summer, so be aware of that if you want to stay away from a lot of people. If you’re looking for a vacation in the Midwest, then you can’t do better than the Windy City. The Windy City is serviced by a variety of major bus lines, which means it will be easy to find a bus schedule that fits your family’s needs and budget. This city is home to some of the country’s greatest theater, comedy, architecture, and deep dish pizza. The summer is the perfect time to visit this Great Lakes city, so start planning your Chicago trip right away. Summer vacation is right around the corner, even if the snow falling from the sky says differently. Take the initiative and get to planning for this year’s summer vacation as early as possible to prevent any travel mishaps. 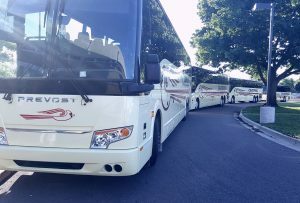 You can even take a charter bus because it’s one of the easiest ways to travel. It’s easy to find a bus schedule that fits yours, so there is plenty of opportunities for you to book a spot. Motorcoaches account for 751 million passenger trips annually, moving more people in some years than commercial airlines do. So, check your local charter bus schedule and hop on one with your family today!